Mohan Murjani’s father B.K. Murjani left India in 1930 and moved to Shanghai to start the family’s apparel business. 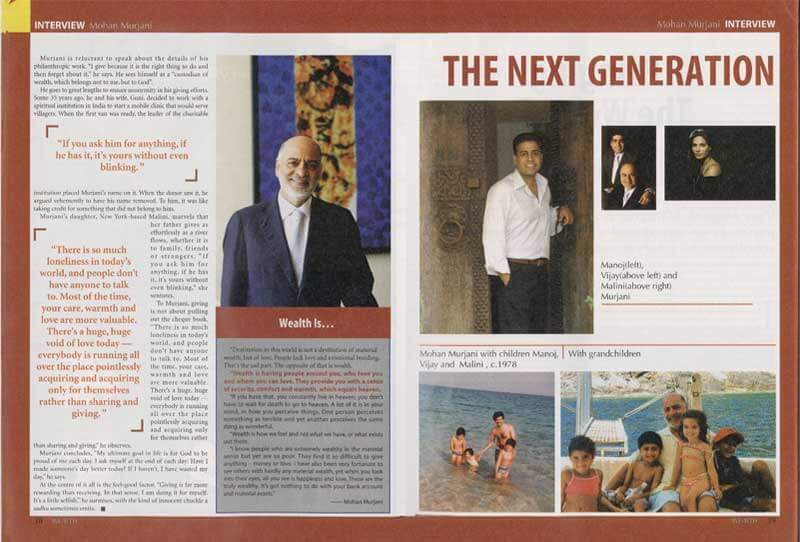 And now, Mr Murjani has a sense of coming full circle as he, along with his son, Vijay Murjani, builds up a portfolio of leading global brands to cater to the luxury, premium and specialty lifestyle segments in India. 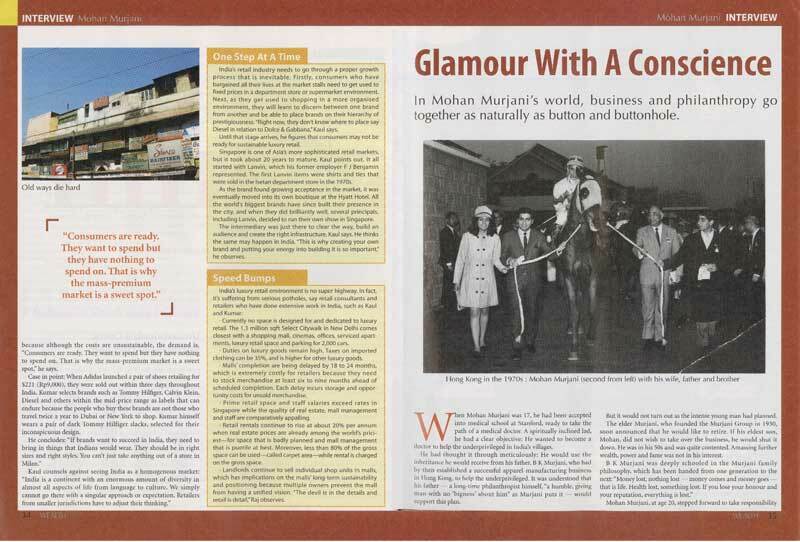 “I joined the family business in 1966 and right from the start was keen on transitioning from manufacturing to designer branding and marketing,” Mr Murjani says. And that’s how the group launched its first brand Marco Polo in the US. “Till then we were only into manufacturing and the single largest garments manufacturing operation in Asia,” he says. And his career of marketing and building designer brands which started with Marco Polo was to culminate in launching the world’s first designer jeans Gloria Vanderbilt in 1979 and then Tommy Hilfiger, then an unknown designer, in 1985. 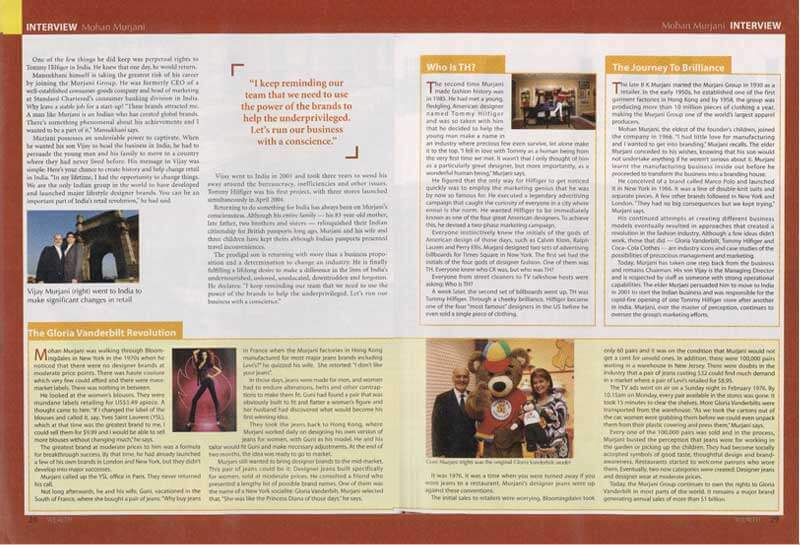 “For me, Tommy and Gloria were two extremes of the American marketing challenge. Gloria was a new category of the jeans product – the women’s fitted designer jeans and we spent a huge amount of money on building the brand. Tommy, on the other hand, was an unknown designer in those days and a buzz had to be created around him using innovative methods,” he reminisces. 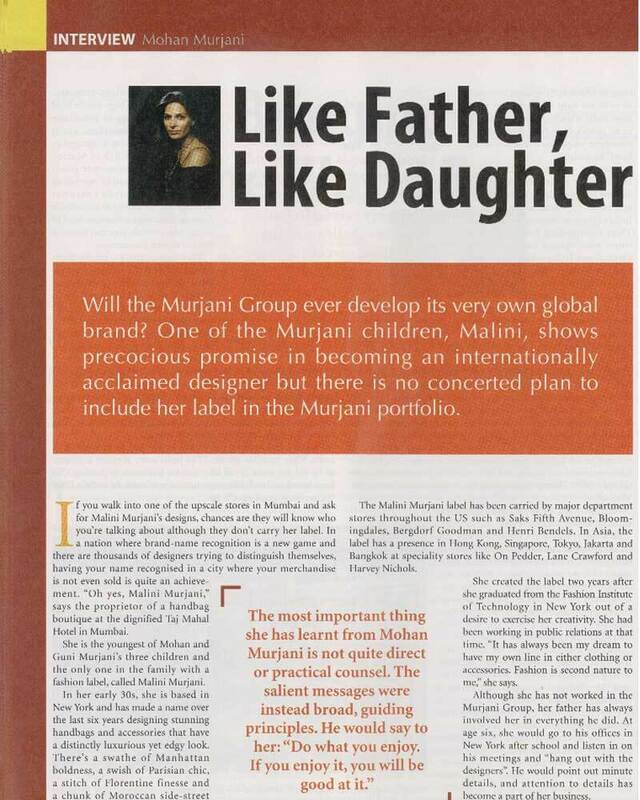 And now Mr Murjani, who still retains an Indian passport, dreams about launching an Indian designer in the global arena. “In those days, having an Indian passport was almost like being a second class citizen. But I’ve always been proud of my Indian identity, even though I was sometimes mistaken as an Italian because of my family name,” he says. And now he sees a great potential in a resurgent India for luxury brands such as Gucci and Jimmy Choo which his group has introduced here. “I’ve been trying to set up shop and do something in India ever since the 1980s and I was actively involved with the Festival of India in New York in the late 1980s. 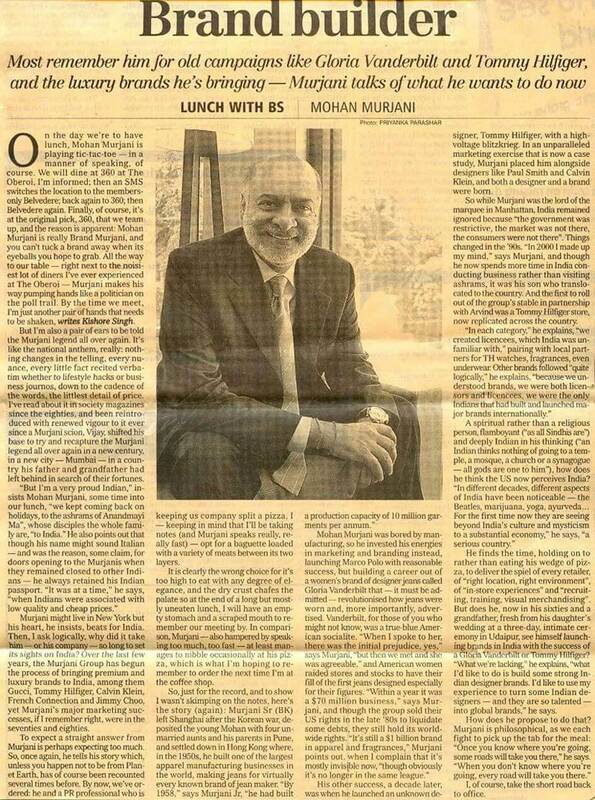 And so when the opportunity presented itself and India’s consuming class was making its presence felt in the late 1990s, I asked my son Vijay to move here, which he did in 2000,” Mr Murjani, who is chairman of the Murjani group, says. “We were after all the only Indian family that had developed and launched global fashion brands and it made sense for us to bring brands such as Tommy Hilfiger to this market,” he adds. And now, 42 years after its foray into the world of luxury lifestyle branding, the Murjani group is pulling out all stops to ensure that the customers in India get the same experience as anywhere else in the world. And while the elder Mr Murjani spends time between New York City, Hong Kong and London, his son Vijay, who is the MD of the group, has relocated to Mumbai. “My daughter Malini is a designer and she’s based in Manhattan while my elder son Manoj lives in Singapore and runs a company called The Wellness Group,” he says. Most remember him for old campaigns like Gloria Vanderbilt and Tommy Hilfiger, and the luxury brands he’s bringing – Murjani talks of what he wants to do now. It is not easy to pin down Mohan Murjani, chairman of the Murjani Group, the company known for its association with A-line brands such as Tommy Hilfiger, French Connection, Gucci, Gloria Vanderbilt, Gucci, La Perla and Jimmy Choo. 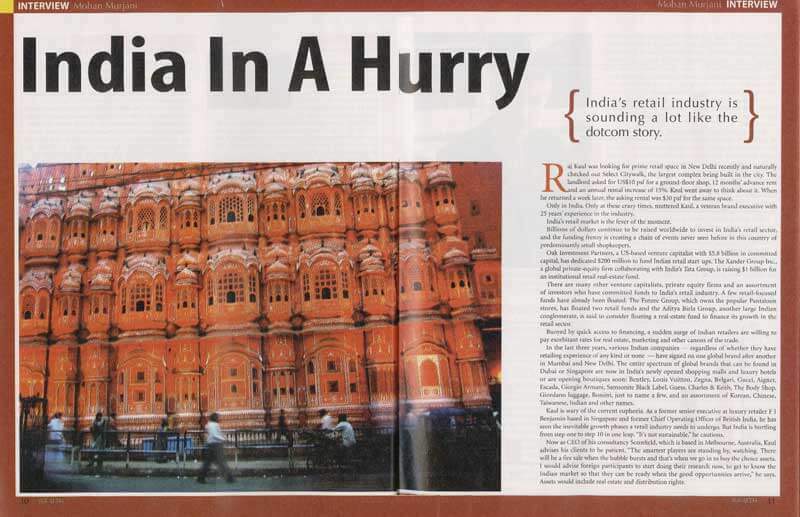 Given that most of these brands are on the verge of making their presence felt in the country, Murjani finds himself on a conveyor belt, shuttling between many cities across the globe. His offices at the Hilton are abuzz with much action with a gaggle of multi-racial workers manning the desks. Against this backdrop it doesn’t strike us as odd when the man, who has been at the helm of affairs of one of the largest apparel companies and creator of brands for the last 30 years, says that when he took over the mantle from his father the late B K Murjani, he was often mistaken for an Italian (Murjani) among his Western compatriots. From Mohan Murjani you will get none of the dour brown-sahib-making-it-big in the West vibe. His father built a reputation in apparel manufacture in Hong Kong way back in the early ’50s and when it came upon his America-reared first-born to lead the way in the late ’60s, he decided to raise the bar by a few notches and spin hi-profile brands. “A few years after taking charge, I felt the need to be a bit more in control of my destiny. I needed to create my own brands,” he reminisces; and so rolled out the first batch of apparels under Pacific Seven and Denimite, to name a couple; until of course he created the legendary Gloria Vanderbilt brand and rolled out (in ’76) the first ever batch of denims, especially styled for ladies. Up until then denim was associated with blue collar workers. Women wore the loose baggy monsters only after the local tailor had them fitted to shape. Murjani’s moment of epiphany was while on a holiday with his wife Guni in the south of France when she stopped over at shops to buy a pair of jeans. Murjani was aghast, after all his factories in Hong Kong had been rolling out jeans for decades. Guni was dismissive and brought his attention to the lack of fit in the denims available. Back home after the holiday he charted out a list of haute designers, Geoffrey Beene and YSL among them, to air the idea of a new project. And then finally zeroed in on Gloria Vanderbilt, taken in by her “distinctive personality” to create a pair of jeans which “pretty much was rated the Rolls Royce of denims”. The prices of denims soared from $9 to $32 and a market was created. “Those were the days when certain restaurants did not allow guests in denims, until of course it eventually became cool to wear a pair of designer jeans for an evening out,” says Murjani. Back home these days he is amused at the sight of young boys boldly strutting their FCUK t-shirts. “It is the sign of the times. The brand helps them express themselves and their new-found freedom. It gives them that edge,” he says. Before he took on the mantle from his father, Murjani was all set to become a medical doctor. He did a year at Sanford, and then decided to take up the reigns from his father, telling himself that he “may be able to help a lot more people with his wealth than with my hands”. Which Murjani suggests, reflects in his latest endeavour — the NGO festival on at the Inorbit Mall, Malad. The 15-day festival, which took off a couple of days ago, has been organised to provide a platform for NGOs who do not find a voice and whose work go unnoticed among the people. Today there are 15 NGOs involved in the festival, and Murjani hopes to scale up the number in the forthcoming years. He has seen the world but when it comes to picking out the most gracious of the lot, Murjani homes in on the Asian woman, “for their wonderful sense of innate grace and fluidity in movement. A confidant woman is an attractive woman,” he says. A confident woman is also one who knows her mind and will not settle for what the shop floor assistant wishes her to buy. On the contrary, she will demand choices to pick from. Mohan Murjani doffs his cap to that. Mohan Murjani, legendary creator of the Gloria Vanderbilt and Tommy Hilfiger brands, has a genius for spinning magic from high-risk ventures. it’s a skill the Murjani Group will need in India’s vicious luxury-retail environment, where it is said no player has ever earned profits. Murjani may just make fashion history again. 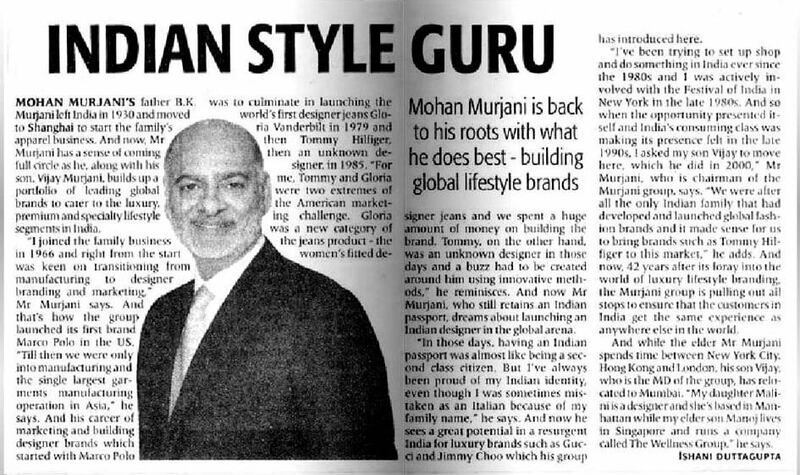 Mohan Murjani made a fortune in the U.S. when he created Gloria Vanderbilt jeans and backed designer Tommy Hilfiger. The he lost it. Today he is rebuilding his empire in the high-end retailing boom sweeping the country he left 50 years ago: India. In the 1980s, amid a sharp downturn in his fortunes, one of the few assets Mr. Murjani held onto was the rights to sell Tommy Hilfiger products in India – even though imported jeans were effectively banned in the country then. He did nothing with it for a decade. But India’s economic boom and the expansion of its companies overseas have created a new class of consumer that has money and cares about global brands. 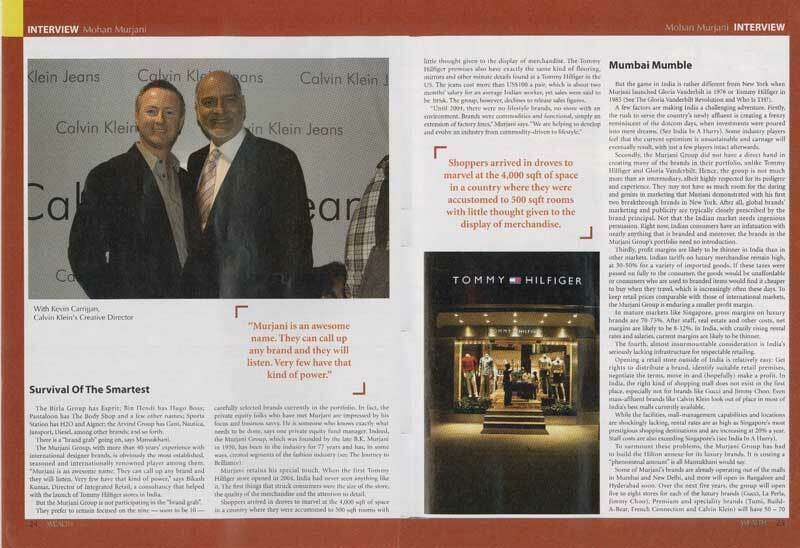 To tap that market, Mr. Murjani, with local partners, in 2004 opened India’s first Tommy Hilfiger store. Though its jeans cost $100 – about as much as two month’s salary for most Indians – it was a hit. Mr. Murjani has since opened nine more standalone Tommy Hilfiger stores and sells Tommy products in hundreds of other shops. This year, he plans to open another 10 stores as he expands the brands he sells in India to include Gucci, Jimmy Choo, Calvin Klein and Britain’s trendy French Connection. 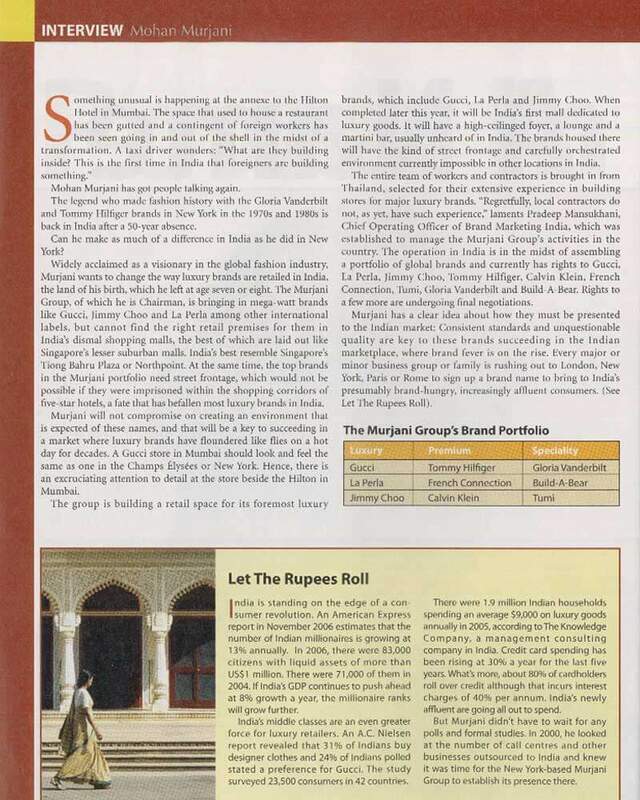 The rise of up market international brands here parallels India’s emergence as an economic force world-wide. For decades after it gained independence from Britain, India’s economy was geared more toward socialism than capitalism and Indians stuck to their traditional unique dress and culture. Foreign brands typically were limited to the lobbies of the nation’s few five-star hotels. I’ve always wanted to come to India, but the market wasn’t there, the consumers weren’t there; India didn’t really have a brand culture,” says the 60-year old Mr. Murjani, who left India when he was 10. All that changed with economic overhauls in the early 1990s, followed by the emergence of India’s high-technology and services sector. India’s software companies hit it big preparing computer systems world-wide for the switch to the new millennium. Its outsourcing companies are prospering with business form overseas. Young workers, many of them making more money than their parents and getting raises 15% or more a year, seek the same internationally recognized, designer products they can purchase on work trips and vacations abroad. They watch MTV. They read fashion magazines. They see top Bollywood stars switching to Western designer dresses; many of its biggest female stars arrived at an awards ceremony last month in gowns rather than saris. These consumers also aren’t reluctant to use plastic: Credit-card loans in India have risen by 30% a year for the past five years. Rani Desai, a 26-year-old research analyst for a think tank in Mumbai, likes to carry designer bags and wear shoes that cost more than her monthly salary, a taste she acquired while studying in London. Her recent purchases include a pair of Gucci shoes with 10 centimeter heels and the latest Louis Vuitton handbag. She has already spotted her next purchase in a magazine. It is a Burberry bag that she can pick up in Mumbai. “i haven’t seen the bag in person yet,” she says. 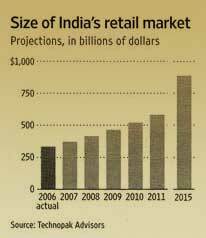 India’s overall retail market is already the eighth-largest in the world, says Mckinsey & Co. While it has more than $300 billion a year in sales, according to Technopak Advisors, a New Delhi based research group, the vast majority of sales still come from the millions of tiny mom-and-pop shops that sell Indian-made products. Sales from chains of branded stores still account for less than 5% of the total. But analysts foresee vigorous growth, especially from high-end retail. Designers and other higher-end brands have taken off, even as other foreign retailers remain largely closed out. The government has prevented companies like Wal-Mart recently firmed up plans to enter India through a joint venture, but it will only be allowed in as a wholesaler; its Indian partner will own the stores. That was the case for single-branded stores too for years, forcing the Murjani family and others to fine local partners. Recently, though, regulations have relaxed to make it easier for these retailers. Last August, French luxury-goods brand Louis Vuitton, which has operated here since 2002 and is part of LVMH Moet Hennessy Louis Vuitton SA, became one of the first brands to own a majority stake in its Indian distributor. Vuitton’s sales in India grew 50% last year. The Murjanis says that in the future they will own all the stores they open. 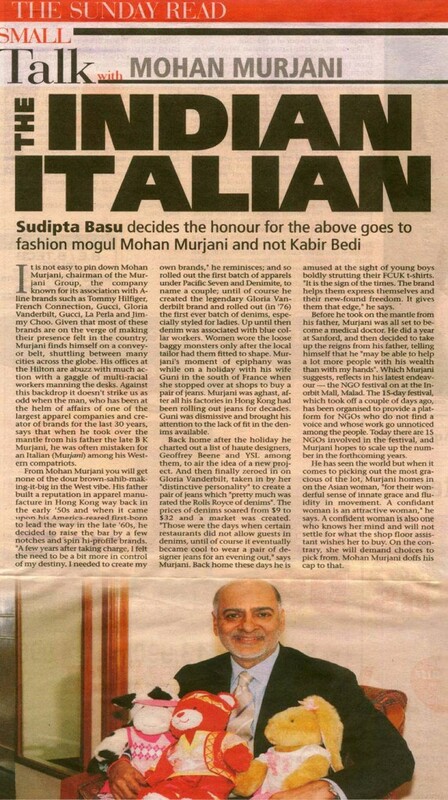 For Mr. Murjani, the arrival of foreign designer labels in India is a fitting coda to the family’s history over the past six decades. When Pakistan split from India in 1947, the family fled its ancestral home in what is now Pakistan. His father, B,K Murjani, left Mohon in India and went to Hong Kong to start his own business. He was one of the first to export clothes from China to the U.S. in the 1950s, at one point of sending 10 million pieces a year to the U.S. company S.S. Kresge, which later became Kmart, says Mohan Murjani. 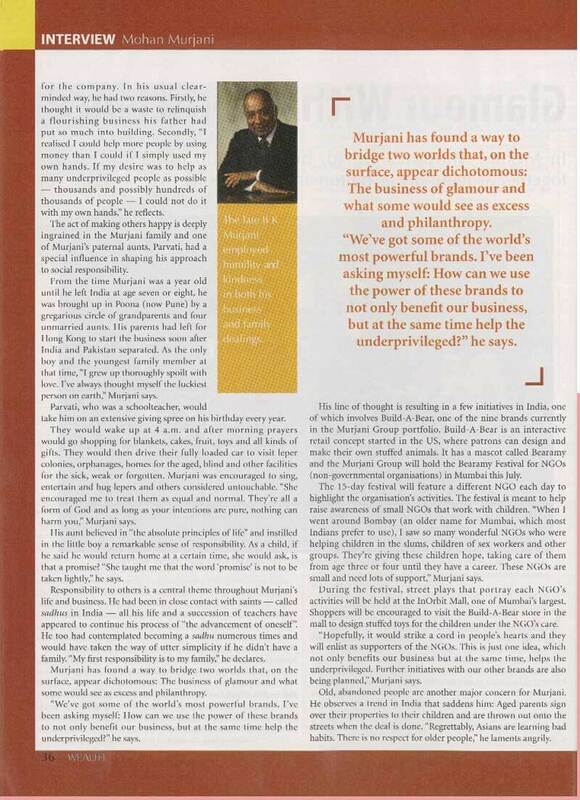 Mohan Murjani attended Babson College in Massachusetts and then entered the family business with a view to expansion. His big idea was to make and market jeans fitted for women and branded with a socialite’s name: Gloria Vanderbilt. They sold for $32 a pair when the average cost of a Levis was less then $10. The jeans brought in as much as $500 million in sales in some years during the 1970s. Mr. Murjani became a minor celebrity in his new home in New York, occasionally singing karaoke with Andy Warhol, he says. In the early 1980s, Mr. Murjani decided to create a jeans brand for men. He helped launch Tommy Hilfiger with a giant billboard in Times Square and bought the rights to Hilfiger sales world-wide. But then Mr. Murjani over invested in a Coca-cola line of clothes and in a new chain of high-tech clothing stores called “Fizzazz” that fizzled. The stock-marked carsh of 1987 left Mr.Murjani with warehouses full of unsold inventory and struggling to pay his suppliers and lenders. “We had stretched ourselves and then the market went bad,” he says. As he dealt with $60 million in debt, he sold his palatial family home in London and the rights to most of the Gloria Vanderbilt brand. He also sold the rights to the Tommy Hilfiger brand to Mr.Hilfiger and a group of investors for an undisclosed amount in 1989. One of the only things he kept were the rights to sell the Hilfiger brand in India. 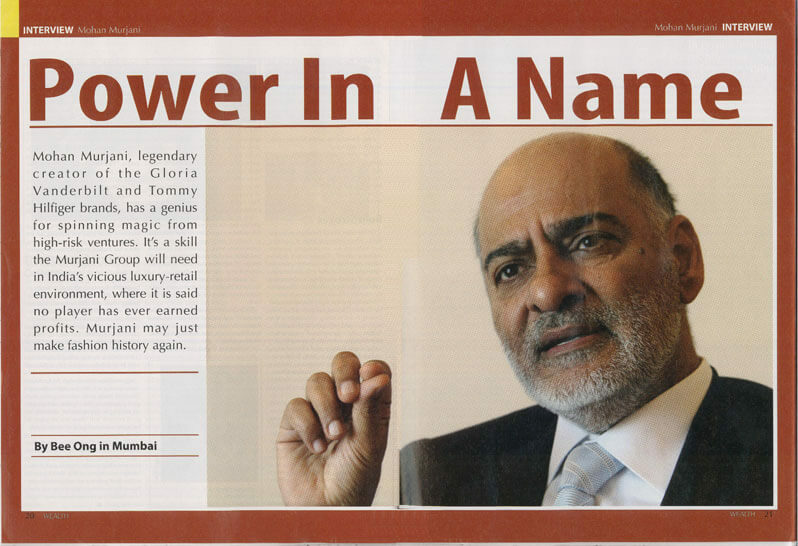 Twelve years later, he sent his son Vijay to scope out the Indian retail market. The elder Mr. Murjani says he moved back to India this year to help out, though he and his wife are shuttling between Mumbai, London and New York. It took the younger Mr. Murjani three years of planning, research and battling with the Indian bureaucracy before he could open the first store. With limited people with experience in high-end retail in India, he brought in specialists from abroad and from other industries like hotels and airlines. The government made the cost of doing business steep; It slaps a 35% tariff on most garment imports. The answer, says father; exactly the same products, atmosphere and prices as consumers would find in a Tommy Hilfiger store in New York or Chicago. If the products are too expensive, the stores too small or shabby or the selection outdated, then high-end Indian shoppers will just wait until they go abroad, he says. 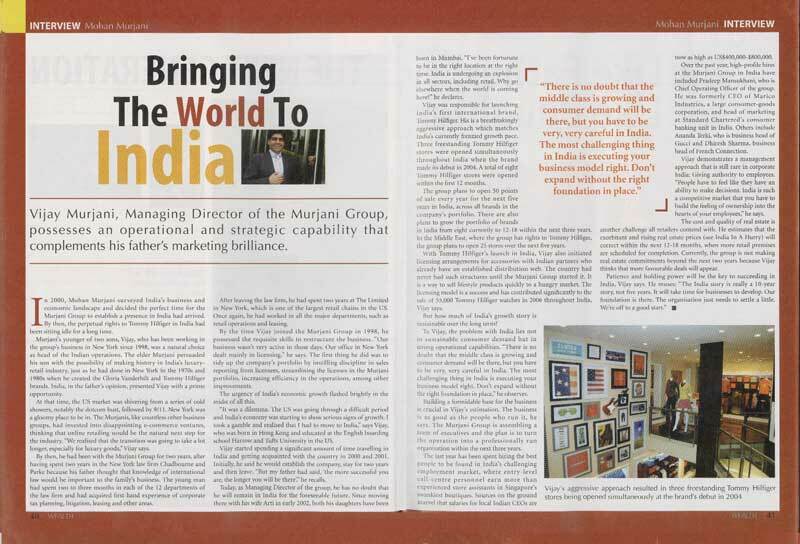 “Indian consumers with all the media that is available to them the Internet, magazines, television they know exactly what the latest products are in the world; they are totally up to speed,” Mr. Murjani says. Hilfiger dressing rooms in Indian stores have heavy doors massive framed mirrors, just like the stores in the U.S. The shopping bags and paper used for receipts are identical. For the new French Connection store in Mumbai, the Murjanis have imported the jeans shelves, indoor billboards and even the mannequins to get the same edgy look that makes the chain popular in Europe. They have made some adjustments. With some Hilfiger branches attracting more than 4,000 customers a day, the signature teakwood floors were getting ground down. “We are switching to stone now,” says Vijay. While the Murjanis won’t disclose details, they say their Tommy Hilfiger business is profitable. Mr.Murjani says the government’s tariff on foreign clothes shrinks profit margins since the clothes are sold at close to the same prices as in London, New York or Singapore. He wouldn’t be specific on revenues, but says that sales at some Tommy Hilfiger stores in India more than doubled last year. One of the Murjani family’s next projects is to bring Tommy Hilfiger, Calvin Klein and French Connection to the new 150-store, 2 1/2 hectare “Select Citywalk,” a $150 million shopping complex under construction in New Delhi. Recently, the complex was filled with hundreds of workers and donkeys scrambling to finish by a May deadline. Construction workers were mixing concrete by hand in the future French Connection store and there was a big puddle in Tommy Hilfiger’s space. When finished, there will be a gourmet grocery store, an Italian restaurant, a pub and one of India’s first Starbucks, says the complex’s general manager Shilpa Malik. Its food court will feel like a hotel lobby, with solid furniture – “none of those plastic chairs,” she says and spots to eat outside to enjoy the view of a two hectare park that fronts the project and covers its 2,000 car garage. At the center of the complex is a dome which will have a separate entrance, exclusively for luxury retailers. The Murjani brands will be competing with other international retailers including Mango, Nine West, and Clinique. 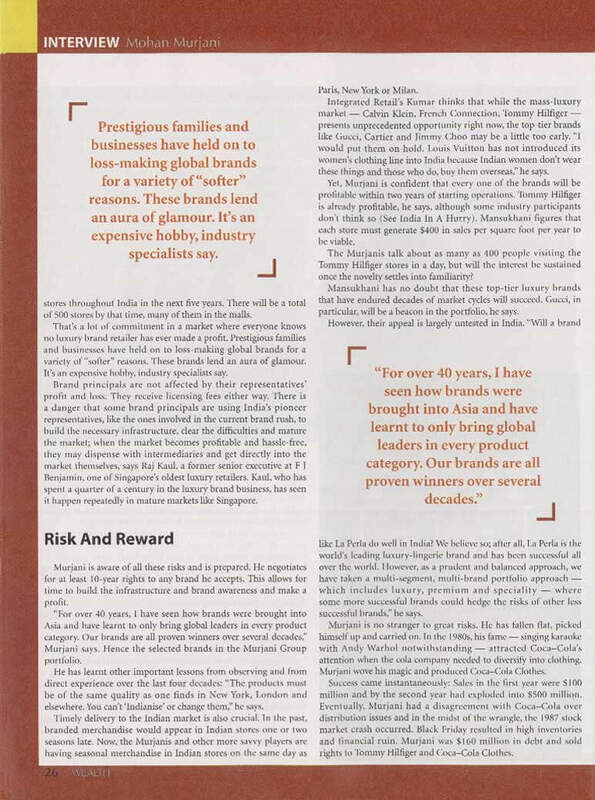 “India has never seen all these brands under one roof,” says Ms. Malik.- Christina Passiarello contributed to the article. FIVE YEARS AGO – Mumbai was not Vijay Murjani’s first choice as a city to move to and make his home. 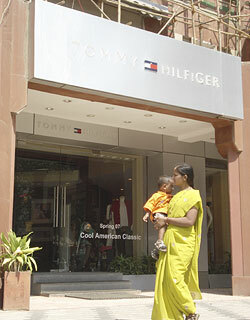 “I moved to India in late 2001 to set up the Tommy Hilfiger business . The first year went by as a learning process as setting up a structure proved more challenging than we thought. Having said that, by April 2004 we launched the brand through store openings in Delhi and Bangalore and went on to open a further 7 stores over the next a fifiteen months,” says the junior Murjani whose father Mohan Murjani is a legendary figure in NYC’s fashion world having launched Tommy Hilfiger in 1985 and earlier the first women’s designer jeans label with Gloria Vanderbilt in 1976. Of course today Vijay Murjani has changed his mind and is comfortable as a Mumbaiker. The Murjanis now have plans to launch 6 more leading international brands Gucci, Jimmy Choo, Calvin Klein, French Connection UK, Tumi & Build-a-Bear in India through the licensing and franchising route. “Today both Mumbai and Delhi are growing and expanding cities with more and more options with respect to entertainment, food and shopping,” says Mr Murjani who considers Mumbai his home today though he’s still a little partial to London where he spent many years. In fact, he currently would not think of shifting to any other international business city such as Dubai or Singapore. “India has something very real about it…why move when everybody is coming here,” he says. And though he has grown up in Hong Kong and the UK and even now travels a lot on business, he and his family are very comfortable having settled down in Mumbai. “When we moved to India back in 2001, relocating was definitely an adjustment for my wife and myself. These days India has become a much more attractive destination for executives, which has helped us in hiring several expats within the group,” he adds. 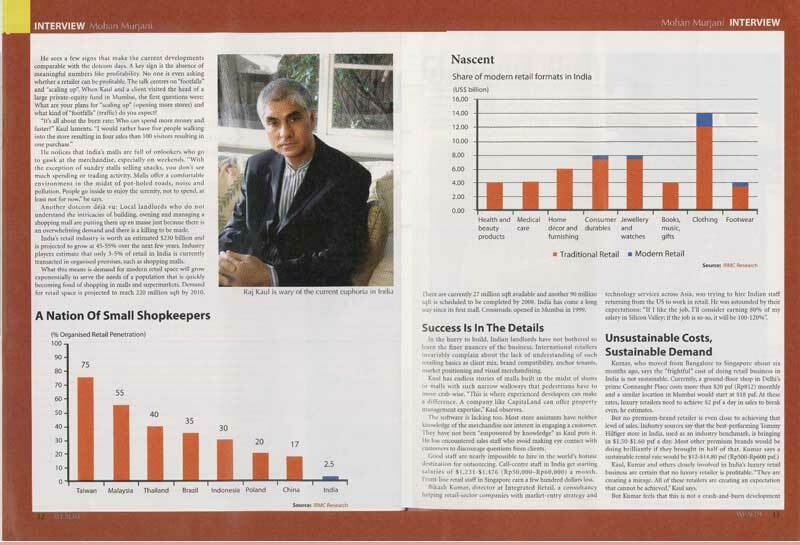 The fact that the Murjanis see the potential of the luxury & premium market in India obviously adds to the excitement. Having launched India’s leading international designer lifestyle brand, Tommy Hilfiger, which currently has nine free standing stores, the group now plans to bring in Gucci, Jimmy Choo, Calvin Klein, French Connection, Tumi & Build a Bear to the Indian market as well. “The brands that we are bringing to India will operate in three different segments of the market ie luxury,premium and speciality. With CalvinKlein and French Connection we will add to our premium portfolio while Build-a-Bear is a specialty brand for children, a segment where we see a gap which we hope to address. India has a huge market for luxury women’s footwear, specially in the wedding season, and that’s where Jimmy Choo fits in. Tumi is the worlds most exclusive travel accessory brand, which will be targeted at the ever growing number of Indian executives travelling both domestically and Internationally,” says Mr Murjani. The group is also planning to add some more luxury brands to its Indian portfolio soon, the names of which Mr Murjani is not ready to announce yet. “Luxury is a very different business…It’s our group’s track record both in developing brands globally, as well as our success with Tommy Hilfiger in India, that gives our partners confidence. A combination of our experience, knowledge and know-how provides a level of comfort, especially when entering a market as important as India for the first time,” says Mr Murjani. The second quarter of 2007 will see the Murjanis launching the new brands in India. The group which is well known globally for its innovative and non-conventional marketing and advertising approach (they were after all the first apparel brand in the world to use the television medium) may also look at building up its own brand in India in future. For now, Mr Murjani feels that the first mover advantage that the group has in India is so exciting that he doesn’t want to give it up even for Manhattan. “The Indian market is very exciting now and we intend to build our brands and retail platforms beyond Mumbai & Delhi to the rest of India. I wouldn’t want to be anywhere else right now,” he says. Though the Murjanis have had a home in Delhi and Vijay found himself living in a hotel in Mumbai in the early days, he feels that the city has grown on him. “ Delhi is a big retail market, but Mumbai – for me – is like New York,” he says.